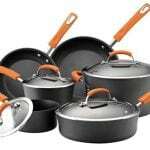 The MultiClad technology of this cookware set made by Cuisinart makes it a keeper. 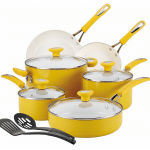 In terms of robustness and long-lasting performances, this set is exactly what you and your kitchen need. 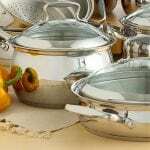 It is not a starter’s kit, but a highly effective and diversified set of high-quality cookware. 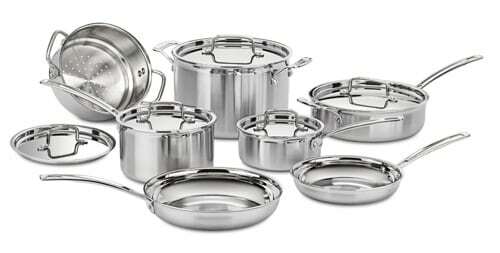 The stainless steel is the main material used for the manufacture of the Cuisinart MCP-12 MultiClad Pro Stainless Steel 12-Piece Cookware Set. This feature only is a good reason for you to look no further. Because the pieces included are made of stainless steel, you will not have to face problems regarding the coatings that are easy to scratch or the plastic pieces that can melt or suffer other types of damages. 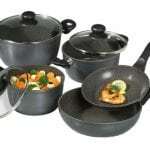 The silver look of all the saucepans, skillets and stockpots included in this cookware set is very modern. The exterior is brushed, while the interior has a clean, mirror-effect. The lids are made of glass and embellished with practical stainless steel additions. The heat surround technology used for the manufacture of this set is absolutely priceless. More specifically, the pots are heated all around. So, the temperature is preserved throughout the cooking process and it is impossible for the hot spots to appear. Cuisinart is a renowned producer of kitchen equipment. It has started as a local business in 1973, but it has quickly expanded to Canada in 1975. Throughout time, the management of Cuisinart has changed, but the quality of their products has only continued to get better. Cuisinart’s offer is quite diversified. They produce a wide variety of cookware, but also a multitude of food processors, coffee and espresso makers and so on. Basically, you can find everything you might need to use in your kitchen among the products from Cuisinart. Cuisinart is very involved in the life of their customers. They have developed a community website, which is full of useful tips and tricks. 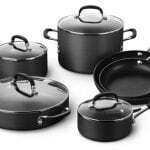 5 and 3-quart covered saucepans, 3.5-quart covered saute pan with a helper handle, 8-quart covered stockpot, 8” and 10” open skillets. Heat surround technology – Also called Tri-Ply, this technology is extremely advantageous in terms of cooking evenly and faster than before. The bottom core of every piece is made of pure aluminum, which is responsible for the equal dispersion of the heat. 18/10 Stainless Steel Exteriors – Long-lasting exteriors made of stainless steel with brushed finish, for a touch of elegance and modernism. 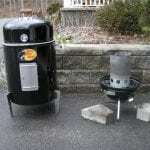 Drip-free pouring rims – You can safely move your preparations from one pot or pan to another or in any other recipients without risking to pour some of the food on the side. Reliable handles – The handles do not overheat and they are robust and safe to grab without gloves. Interchangeable lids – For your convenience, some lids fit to more than one piece. Food sticks to the bottom – This set does not have a non-stick coat. The usage of a little oil is mandatory to avoid food from sticking on the pan’s bottom. 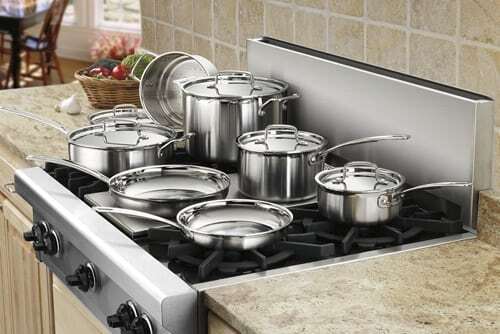 The Cuisinart MCP-12 MultiClad Pro Stainless Steel 12-Piece Cookware Set is top notch. The stainless steel does its job without a flaw and all the other applied technologies by Cuisinart work perfectly and are able to meet the needs of the most demanding chef.